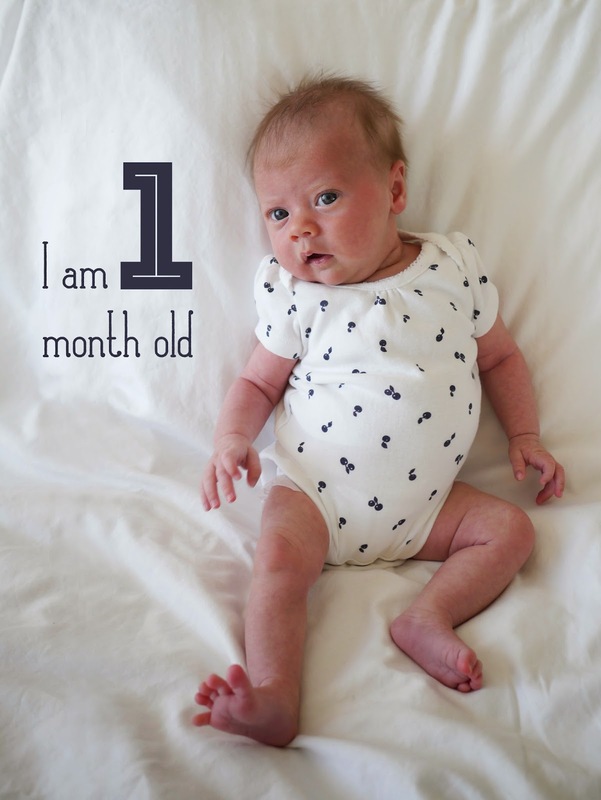 Today our little baby Mathilde is one month old! When Lola was a baby I took a monthly photo of her throughout her first year. You can see Lola's monthly photos here. I plan to do the same for Mathilde so expect to see a "monthly birthday" shot here on the 24th of each month. As always I took about a million shots of Mathilde to ensure that I go at least one that I could use! Ok, so maybe not quite a million, but there were lots. Here are some of my other favourites from Mathilde's photo shoot today. I propped Mathilde up against pillows for some of the shots but being a little top heavy with that big head of hers she kept tipping to the side! She didn't seem to mind too much and made happy noises each time she landed on her belly. Towards the end of our shoot Mathilde started to get quite wriggly. Those little arms and legs of hers were flying all over the place. I love how action packed these shots look. She looks as though she's jumping over something, dancing and even standing up in that last shot. I think I might have to do something creative with these shots. And I could resist squeezing those chubby little cheeks of hers! Happy one month birthday Mathilde!